I am not known for my love of blue, so when Sally Hansen decided to see how mad they could make the polish world with the least amount of effort I was not terribly bothered. The blues seemed close enough, and I wasn't interested in either version. The polish world, however, lost their collective minds at once. I now understand it...sorta. My new favorite person, Jeannette, offered to sell me some polish after she saw a post on the facebooks asking for opinions on multichromes. Apparently I offered too much monies in return, because she sent me the most epic nail haul...and even included treats for the douchecat. When she heard that I had never tried (nor knowingly seen) the Original Pacific Blue, she decided to send me a bottle as well. Oh my. I won't be buying it for $10 on eBay, but I am very glad that I have it now. It is a lovely color. But because I'm no good with solid colored manicures...I added neon pink dots. So what is the verdict? Do you love the old Blue? What is so different about the new one? Maybe next time I have a coupon, I'll pick up a bottle to compare. I am really curious now. This look is so cute! When word got out that Sally Hansen changed the formula of Pacific Blue, I figured "what the heck! It's only a few bucks," so I bought a bottle. Honestly, it's not the best blue out there. I mean, I get the hype... It has a good formula and the shade is REALLY nice, but if it I hadn't known that the color was going to be changed I'm sure I wouldn't have bought it. Love it with the pink, though! I love your dotticures! I pretty much felt the same way. Though it is hard to find anything around here, and I wasnt especially interested...and thanks! 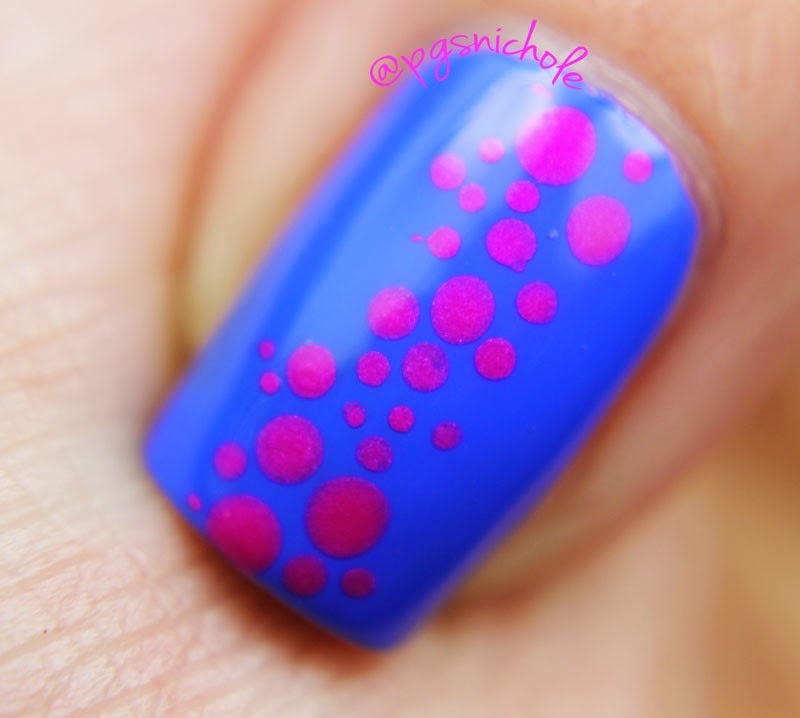 Dotticures are becoming a fast favorite! I offered you one last year. lol The new version is really really different. Sadness. The one I have is I thiiiink the new one, and it's not so bad. I like the colour. For $2.50 it's a good blue! The old one is nice too, but I don't super understand the freak out. I think, in general, people don't like change. Especially when it is done sneakily. If SH had announced the discontinue and renamed the new one, I'm sure people would have been less spastic about it. I just wish they would discontinue colors instead of recycling names. Makes looking for swatches or backups of the original formula a royal PITA. Sally's original Mellow Yellow was a sheer yellow-green that I LOVED. Now it's a bright tweety bird yellow. I have yet to find the new Pacific Blue. Regardless of how I feel about any given color, if you change the formula I think you MUST change the name. It should be a law.